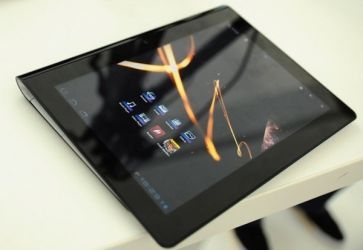 "We've already seen press shots and teaser videos of Sony's S1 Honeycomb tablet and dual-screen S2 (and had our eyes on them ourselves), but Germany's Golem website managed to spend a bit of time with both of the devices at an event in Munich"
Sony is preparing not just one, but two takes on the scalding hot tablet market. While the S1 looks like it could slide a cake mighty nicely, the S2 looks a bit more interesting. The S2 intruigues me more as it seems a bit more portable, but I honestly do not know if that would translate into more use. A decent smartphone probably provides a similar enough experience to a mini-tablet, so why have two devices fitting the same form factor? I can see where a tablet fits in, just like a netbook, and in working with computers, a desktop or powerful laptop is useful as well. Does anyone see why they might want a mini tablet, except where they do not want a smartphone?